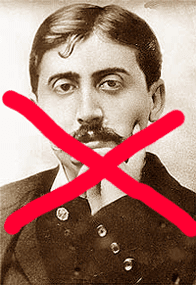 It's not like I have a personal issue with Marcel Proust--he's been dead for almost eighty-six years. His mega-novel In Search of Lost Time may well deserve its lofty reputation, though I admit it puts me to sleep. No, what's so wrong and so irritating is that Proust has become the undeserving poster-boy of olfactory memory. at the Duke University Medical Center . . .
First off, let's stipulate that the Duke team did a fine experiment and they are entitled to publicize it. My beef isn't with the sleeping mice; it's with Proust's pastry and the flood gates. It's a complete misrepresentation of what Proust actually wrote. Here's why. For most of us, the magic of smell memory is that it transports us instantly to a vividly detailed, often emotionally charged scene from the past. It's a remarkable experience. But when the narrator of Swann's Way (a stand-in for Proust) dunks a madeleine in a cup of tea the aroma produces a vague and perplexing emotion. He struggles for several minutes to pinpoint it. He agonizes. He re-dunks. This goes on for five tedious pages until the young Marcel finally recalls having had tea and madeleines as a kid. Whatever it was Proust described, it was not the opening of flood gates, the flicking of a switch, or the sudden flash of detailed sense-memory. On top of this, people frequently credit Proust with being the first to describe odor-evoked memory. As I show in my book, this is a complete crock. The vividness of smell memory was a common theme well before Proust's time. It was written about decades earlier by such great American authors as Edgar Allan Poe, Nathaniel Hawthorne, and Oliver Wendell Holmes. So credit where credit is due. It's time to let the bad Proust meme fade from memory.